Even as the world grows more comfortable with globalization, people continue to feel the strong pull of nationalism. This enduring sense of national identity is seen in a number of ways. There is a widespread belief among people in most nations that their culture is superior to others and that it needs protection from outside forces. Significant numbers of people assert that parts of neighboring countries rightfully belong to their country. And most would like to tighten controls on the flow of immigrants into their countries. In the United States, Eastern Europe and throughout most of Africa, Asia and Latin America, majorities believe that their culture is superior to others. This sentiment is particularly strong in a number of developing nations. Fully nine-in-ten respondents in Indonesia and South Korea and more than eight-in-ten Indians (85%) are strong boosters of their own culture. In fact, Jordan is the only developing country surveyed in which a majority of the population does not believe their culture is superior. Among wealthy nations, Americans stand out for their sense of cultural superiority. Six-in-ten people in the United States agree with the statement: “Our people are not perfect, but our culture is superior to others.” By comparison, just a third of the French claim their culture is superior to others. Only about four-in-ten in Great Britain (37%) and Germany (40%) say the same about their cultures. In Western Europe, only in Italy does a majority (55%) of the population view their culture as better than others. Among the world‘s people, the belief that their way of life needs protection from foreign influence is even more pervasive than the sense of cultural superiority. This sentiment also is strongest among people in a number of developing countries. Nearly nine-in-ten Turks (89%) agree that their way of life needs defending, an overwhelming 69% completely agree with that statement – by far the highest percentage in the world. But the general view is nearly as widespread in Indonesia (87%), Uganda (87%), Kenya (86%), Senegal (86%) and Egypt (85%). Strong majorities in most of Latin America, Africa, Asia and the Middle East/Conflict Area also want to defend their way of life from outside influence. Fewer people in Western Europe are persuaded that their way of life needs protection. Still, narrow majorities France (53%), Great Britain (51%) and Germany (51%) say their way of life needs defending. Italians, who have a greater sense of cultural superiority than others in Western Europe, also are more likely to say their way of life needs protecting (68% agree). A similar pattern is apparent in the United States. More than six-in-ten Americans (64%) say their way of life needs protection from foreign influence, while just half as many (32%) disagree. Territorial nationalism, the cause of many conflicts throughout history, is still alive and well. Majorities in 22 of 42 countries where the question was asked say that there are parts of neighboring countries that really belong to their own country. The potential clash of such territorial ambitions is acutely evident in several global hot spots. Three-in-four Indians (73%) and two-in-three Pakistanis (67%) feel parts of neighboring countries rightfully belong to their own. Seven-in-ten Lebanese (71%) and six-in-ten South Koreans (63%) also believe parts of other countries really belong to their country. At least half of the respondents in the six Asian nations in which this question was asked – including the Philippines (79%) and Japan (50%) – believe their countries have justifiable territorial claims. Fewer people in Western Europe and North America express such sentiments. Still, a third of the Germans and a quarter of the French express this view. Italians are divided on this issue: 42% agree that parts of neighboring countries belong to Italy, while the same number disagrees. While a majority of Americans (52%) reject the idea that other countries‘ land belongs to the U.S., nearly a third (32%) agree with that statement. Nearly two-thirds of Russians (63%) believe parts of neighboring countries really belong to Russia. That number has tripled since the 1991 Pulse of Europe study, when just 22% of Russians expressed that view. Majorities in Poland (59%) and Bulgaria (54%) also say there are parts of other countries that really belong to their own countries, although the percentage holding that opinion in each country has not changed significantly in the past dozen years. Large majorities in several countries affirm each of these sentiments – they believe their culture is superior, that it needs defending, and that other lands are rightfully theirs. People in India, for example, are among the most likely to agree with all three statements. 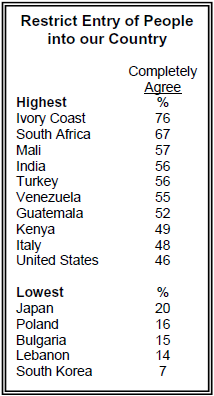 Turks, Bangladeshis, South Africans and Pakistanis also rank relatively high on all three measures. By contrast, the British, French and German people express far less nationalism, based on these questions. They are among the least likely, of all nations surveyed, to say their culture is superior, that their way of life needs protection, and that other lands really belong to their countries. Globalization is not just about international commerce and the cross-border flow of investment and communication. It also involves the movement of millions of people across national borders each year. Immigrants and minority groups are generally seen as having a bad influence on the way things are going by people in most countries. Only in Canada does a strong majority of the population (77%) have a positive view of immigrants. Among other advanced countries, Americans show the greatest support for immigrants (49%). Nevertheless, a large minority of Americans (43%) believes immigrants are bad for the nation. Half or more in France (50%), Britain (50%), Japan (55%), Germany (60%) and Italy (67%) say immigrants are bad for their nations. Immigrants are particularly unpopular across Europe. In every European country except Bulgaria immigrants, on balance, are seen as having a bad influence on the country. This negative sentiment coincides with the fact that for the first time in modern history, immigrants now comprise a large and growing minority in every Western European nation surveyed. Negative sentiment is even higher in Eastern Europe. Strong majorities in the Czech and Slovak Republics take a dim view of immigrants (79%, 69%), as do a majority in Russia (59%) – a country where illegal immigration is soaring. Respondents in Poland and Ukraine have a somewhat less negative opinion of immigrants (45% negative in Poland, 47% in Ukraine). Given the widespread negative attitude toward immigration, it is not surprising then that overwhelming majorities in 38 of 42 countries where the question was asked support tighter immigration controls. This view is shared by overwhelming percentages in countries that take a dim view of immigrants, such as the Czech Republic (83% support tighter controls), but also by smaller but substantial majorities in Canada (69%), which has a favorable opinion of immigrants. While border concerns are widespread, the intensity of public views about restricting immigration varies. Nearly half of Americans and Italians (46% and 48%, respectively) completely agree that entry to the country should be more restricted, but it is not only people in wealthy countries who want to erect more barriers against foreigners. Three-quarters of those surveyed in the Ivory Coast (76%), two-thirds in South Africa (67%), and majorities in Mali, India, Turkey, Venezuela and Guatemala feel strongly about this as well. In Japan, which already has some of the world’s toughest immigration laws and the lowest immigration rate among advanced societies, just 20% completely agree that tougher restrictions should be placed on people entering the country. Poland, Bulgaria and South Korea have even lower levels of intense opinion about this issue. Anti-globalization protestors have long leveled their fire at a number of institutions – international corporations, the World Trade Organization, the World Bank and International Monetary Fund – that they claim promote and abuse globalization. For the most part, the public rejects the criticisms of these symbols of a new global order. In 33 of 43 countries in which the question was asked, majorities think that foreign corporations have a generally positive influence on their countries. Majorities in every African country surveyed say major foreign companies have a good influence. Asians also have a favorable view of multinationals, although opinions are somewhat less positive than in Africa. Approval of foreign firms is highly favorable in Vietnam (93%), China (76%) and the Philippines (74%), but less so in South Korea (56%), Bangladesh (48%) and India (46%). Latin Americans also have a generally favorable view of multinationals – with the notable exception of Argentina, where just a quarter of respondents believe major foreign companies have had a positive impact on their country. By contrast, Americans and Europeans have more measured opinions of companies from other countries. Just half of those surveyed in the U.S. (50%), France (50%) and Italy (51%) give global firms good marks. Multinational companies are viewed favorably by even fewer respondents in Poland (44%) and Russia (42%), which have seen a number of big foreign companies acquire local businesses. It is important to note that while opinion of multinationals is favorable in most countries, most people say such firms have a somewhat good influence on their countries, rather than a very good influence. In North America and Europe, at most only about one-in-ten say foreign firms‘ influence has been very positive. As might be expected, there is a correlation between public sentiment toward globalization and multinational companies. People who think well of big companies from other countries generally take a more positive view of the effect of globalization on their nation than those who see foreign companies as a problem. This pattern is seen in all advanced economies. It is also notable in a number of developing nations, such as Bolivia, India, the Philippines, Russia and Bulgaria, though in most nations, even those critical of international firms have, on balance, favorable views of globalization. Public support is even more extensive for international financial organizations such as the World Bank, the International Monetary Fund (IMF) and the World Trade Organization (WTO). In most developing countries in Africa, Asia, Latin America and the Middle East, majorities think such international institutions have a good influence on their societies. Nearly six-in-ten people in North America, Western Europe and Japan agree. Criticism for these multilateral institutions is largely confined to countries that have recently suffered from economic belt-tightening – government spending cuts, higher interest rates – imposed by the World Bank and IMF in return for international loans. Two-thirds of Argentines (66%), more than half of Turks (57%) and nearly half of Brazilians (48%) say such institutions have been bad for their countries. Notably, about four-in-ten respondents in Bangladesh and India, and six-in-ten in Pakistan, offered no opinion about these institutions, although their countries have received billions of dollars in loans from the World Bank and IMF. Still, positive assessments of these institutions far outnumber negative ones in India and Bangladesh, but Pakistanis are divided (23% positive/18% negative). Criticism of these organizations is most clearly linked to overall concerns about globalization in North America, Western Europe and parts of Eastern Europe. While the World Bank, the IMF and the WTO are generally rated as having a good influence in these parts of the world, people who are critical of globalization overall take a significantly dimmer view of these institutions. To a considerable degree, anti-globalization protestors have simply failed to register on the public‘s consciousness. Majorities or pluralities in most of Africa, Asia, Latin America, the Middle East and Eastern Europe say they do not know enough about anti-globalization critics to have an opinion or declined to offer one. In countries where anti-globalization protesters are better known – mostly in North America and Western Europe – their image is fairly negative. In Italy, the site of a bloody clash involving anti-globalization protesters at the 2001 G-8 summit, negative opinions of the protesters outnumber positive ones by two-to-one (54%-27%). Majorities or pluralities in other Western European nations – as well as the U.S. and Canada – have unfavorable views of the protesters. The Philippines is the only country in which a majority (54%) believes the anti-globalization protesters have a positive influence on their country. But there are several countries in which sizable minorities give them positive ratings, including France (44% positive), where anti-globalization leader José Bové bulldozed a McDonalds some years ago, South Africa (44%), Guatemala (44%), and Honduras (46%). In Bolivia, where popular resistance to the privatization and sale of municipal water supplies is ongoing, nearly half (47%), give the protestors positive ratings. Non-governmental service organizations (NGOs), such as the Red Cross, Care International and Amnesty International, are well known and well liked. Solid majorities in most countries – more than three quarters in North America and Europe, with the exception of Bulgaria (68%) – believe non-governmental organizations have a positive influence on their countries. Support for these organizations, which deliver humanitarian relief and work to protect the environment and defend human rights, is nearly as strong in most of Africa, Latin America, Asia and much of the Middle East/Conflict Area. The only significant criticism of non-governmental organizations is in Jordan, where four-in-ten (42%) say such organizations have a bad influence on the nation. About one-in-five in Bangladesh (27%) and Japan (23%) also say NGO‘s have had a negative impact. Trade unions, which are often at odds with corporations and often critical of globalization, are held in fairly high esteem in many parts of the world. About six-in-ten Americans (63%) and French (59%), and somewhat higher percentages of Germans (65%) and British (67%) think organized labor has a good influence in their societies. But as is the case with corporations, support for labor unions is broad but tempered. Even in North America and Europe, where people have a generally favorable opinion of unions, only about one-in-ten say they completely agree that unions have a good influence on their countries. Argentina is the only country in which an overwhelming majority (75%) says that trade unions have a bad influence. Criticism of unions also is widespread in Jordan (57% negative) and in Venezuela (55% negative), where strikes recently crippled the economy. In instances where the authority of international organizations and national governments come into conflict – as with global environmental efforts and the International Criminal Court – Americans come down on the side of national sovereignty, while Europeans tend to be more supportive of international authority. But there are interesting variations in European views on these issues. 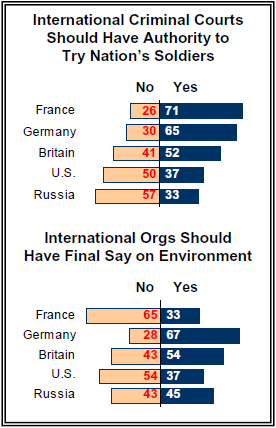 For example, two-thirds of the French (65%), along with most Americans (54%), say their national governments should have the final word on global environmental disputes as opposed to an international organization like the U.N. The balance tilts the other way – toward giving an international organization final say – in Great Britain (54%) and Germany (67%). Russians are divided, with 45% saying the final decision should rest with the U.N. or another international body and 43% saying the Russian government. Americans are just as resistant to ceding authority over U.S. military forces. Just 37% say the International Criminal Court should have jurisdiction over U.S. troops accused of war crimes, even if the U.S. government refuses to try them. People in Russia agree – just one-in-three Russian respondents favor giving the International Criminal Court the right to try Russian troops. But the French side with the Germans and British in supporting the authority of the international court to try their countries‘ troops if their governments refuse to do so.